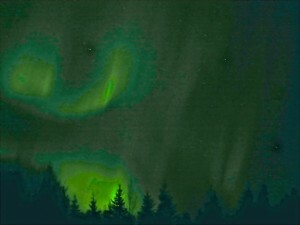 A few fiends and I went to Fairbanks, Alaska, in early March to hunt for aurora. We had partial success. Aurora is caused by the solar wind of charged particles flung out by the sun’s nuclear reaction. The ions take two days to reach the Earth. Once they are captured by the Earth’s magnetic field, they are corraled to the polar regions. When they enter the Earth’s atmosphere, they collide with oxygen and nitrogen atoms that cause green, blue, red and purple aurora lights. 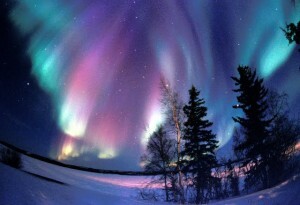 Aurora borealis or northern lights occur in the arctic region, and aurora australis occur in the antarctic region. 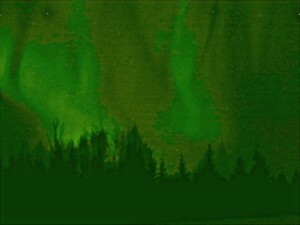 Fairbanks is close to the arctic circle and is one of the best locations to view the aurora borealis. As the aurora is visible at night, we need to go there in the cold months when the midnight sun is not keeping the sky bright all day. 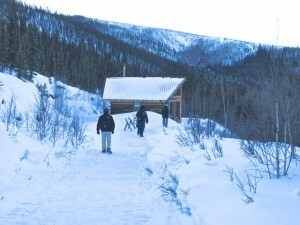 Winter in Fairbanks can be brutally cold, with temperature dropping down to an average of -20F (-29C) or colder. But we thought seeing the aurora borealis was important enough for us to brave the extreme cold. 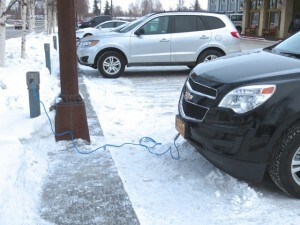 The parking lot of our hotel offered electrical outlets for us to plug in the heater to keep the engine oil from solidifying. To protect myself from the bitter cold, I brought long underwear, two sweaters, snow pants, down jacket and an overcoat, ski mask, knit cap, mittens, and boots. They served me well and I was warm and snug. 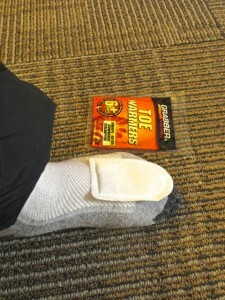 For added warmth, I adhered chemical toe warmers to my socks. They must have worked since I did not complain about freezing feet. 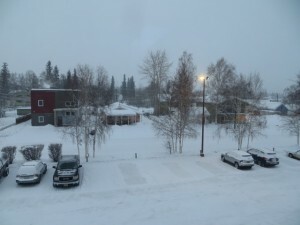 We spent four days in Fairbanks. Two of the days were snowing, and the sky was overcast with thick clouds. Obviously wasted days. 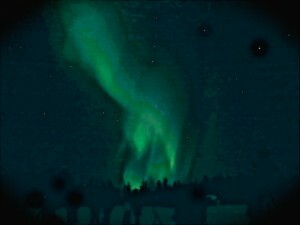 On one of the clear days, we drove 56 miles to Chena Hot Spring Resort to view the aurora. The long road serves scattered houses and ends in the resort through a large state park with no residents. There are no cell phone service in the big park, and we would be stranded in the bitter cold if we got into an accident. Parts of the road was covered in new snow which made the driving easier. 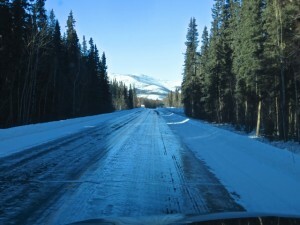 On some stretches of the road, water froze and formed slippery “black ice” which were dangerous to drive on. 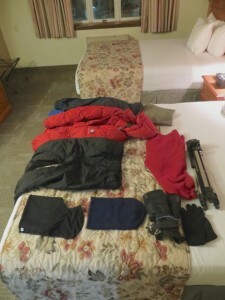 When we returned from the resort at 2AM, the temperature was -15F (-26C). 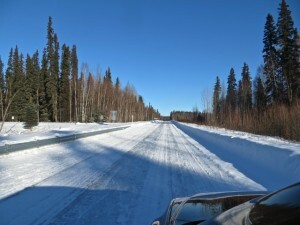 I drove at 20 miles per hour in half of the trip, taking twice as long as local Alaskans. But we were safe. In the resort, we climbed up a slight hill to its “aurorium”. We would sit in the small house to keep warm at night while we wait for the aurora to show. 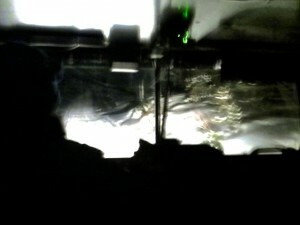 But we had a better option when we were fortunate to find seats in the resort’s snow coach. 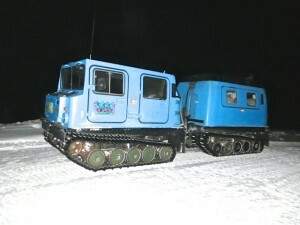 This vehicle climbed 1,200 feet up a hill for an unobstructed view of the aurora. Riding the snow coach was a like being shaken in a broken food grinder. It heaved and rattled and jolted and moaned. And it was an interesting experience unlike any other. We waited in a large yurt. The resort provided us with hot drinks, ramen noodles and soup. 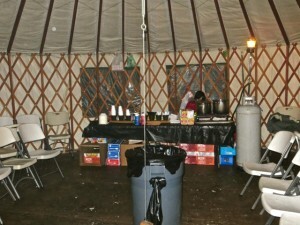 The yurt was crowded with dozens of tourists. The drum stove was useless as the green wood provided refused to burn. 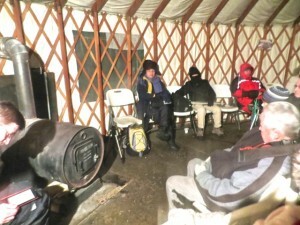 My friends were all bundled up next to the cold heater, but they were warmer in the yurt than at -7F (-20C) outside. To operate my camera outside, my exposed fingers became numb in one minute. We waited for 5 hours in vain. The aurora never showed this night. I took this photo with one of the stars being red in color. I think it was the planet mars. 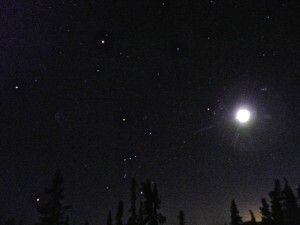 On the other clear night, we went to a lodge and waited. 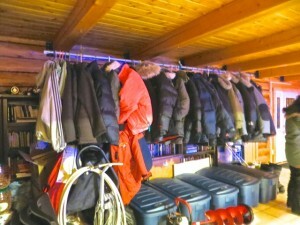 The lodge provided warm coats to guests who might not be properly dressed. 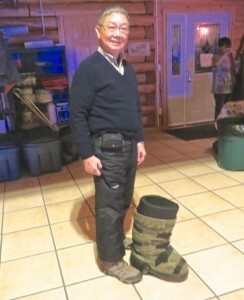 This huge snow boot was fit for a polar bear, the abominable snowman or Big Foot. 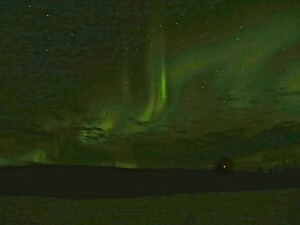 We were hopeful that we would catch a multi-colored, spectacular, active aurora. Photos like this is very enticing. But this photo is probably the result of months of patient waiting by a dedicated and skillful photographer. 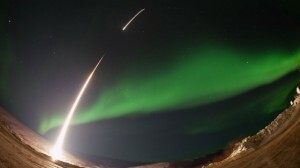 A few hours before our arrival at the lodge, NASA shot a rocket from a base 25 miles north of our lodge into the aurora above. NASA is trying to gain a better understanding of the aurora phenomenon. This picture released by NASA shows the aurora to be green and not a ribbon-like steak of light. We saw our aurora at midnight. It spread in size and covered a good part of the eastern sky. It resembled wispy clouds reflecting city lights. It danced slowly and swirled in a very slow waltz. 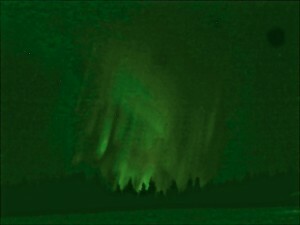 The aurora was green and did not dazzle us with the rare red or purple. I was less acquainted with my camera than I should have been. 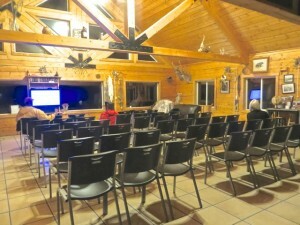 I fumbled in the bitter cold with numb fingers and had to retreat to the lodge every few minutes to warm up. I sealed the camera in a plastic bag to keep warm moist air from fogging up the lens, and had to wait several minutes for the camera to warm up before opening the bag. I did not operate the camera right and the photos were less than acceptable. After substantial editing, these are the best they can be. At least I experienced this wonderful natural phenomenon. At least one of my trip mates is thinking about going back to Fairbanks next year to try his luck again. Maybe I will join him. Posted by Robert Wu on Sunday, March 9, 2014, at 5:58 pm. Filed under Uncategorized. Follow any responses to this post with its comments RSS feed. You can post a comment or trackback from your blog.